To celebrate Valentine’s, I'm sharing a simple recipe for a luscious dessert that you can whip up in no time for your sweetheart tonight. In fact, this very dessert is on our dinner menu tonight! Nothing says Valentine’s quite like chocolate…and the ultimate romantic chocolate treat is fondue! What's not to like about rich, melty chocolate and tasty treats to dip into it. 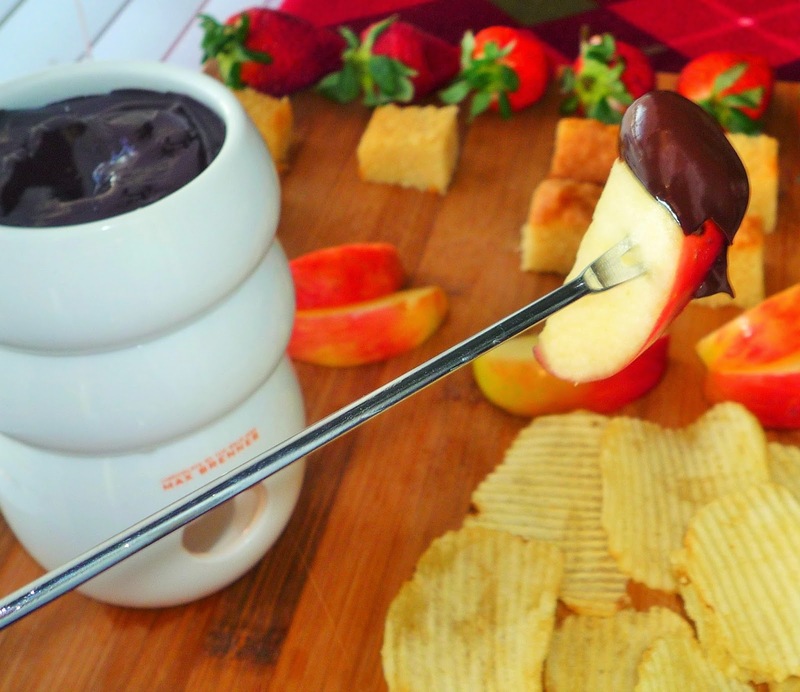 Best of all, this chocolate fondue easy to make…and really fun to eat! To ensure the best end result, make sure to splurge on the highest quality chocolate and dippers that you can find. 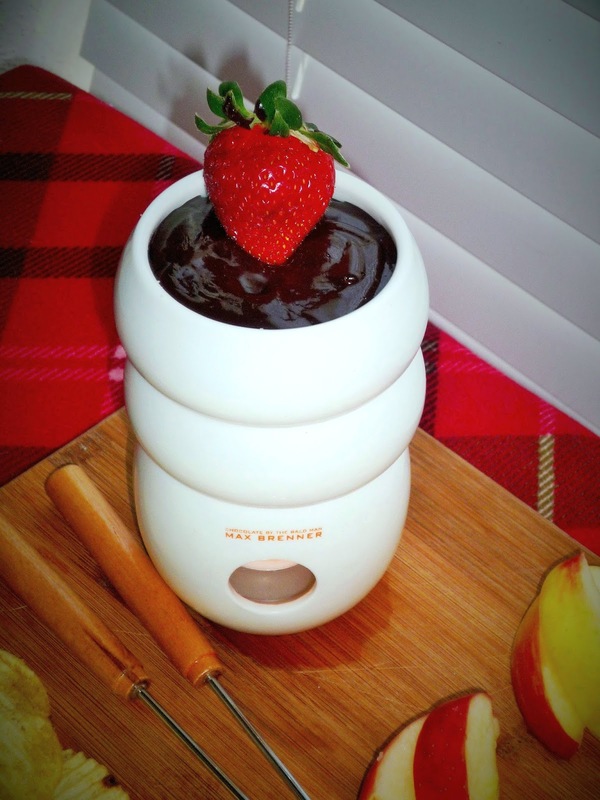 From there, have fun…fondue is infinitely adaptable!! My Split Decision Cinnamon-Orange Fondue is sure to make your sweetie smile tonight…or any night that you’re looking to up the romance factor. Around here, Michael is a milk chocolate fan…while I prefer semisweet. 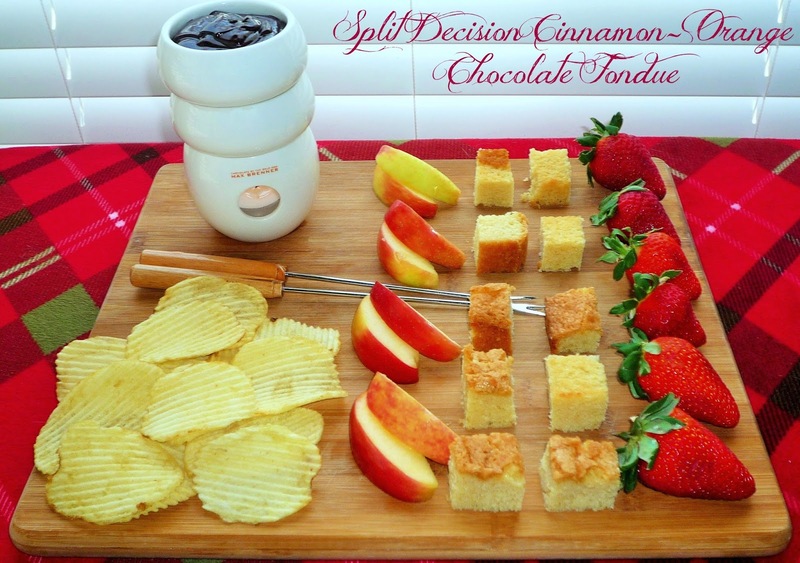 My harmonious fondue features both types of chocolate…hence the “split decision” in the title. This decadent fondue is flavored with orange liqueur and orange zest, along with cinnamon and a dash of vanilla extract. The mixture can be prepped earlier in the day and stored in the fridge…then it’s ready to be warmed up just before serving. Everyone has their favorite dippers…so make it your own. 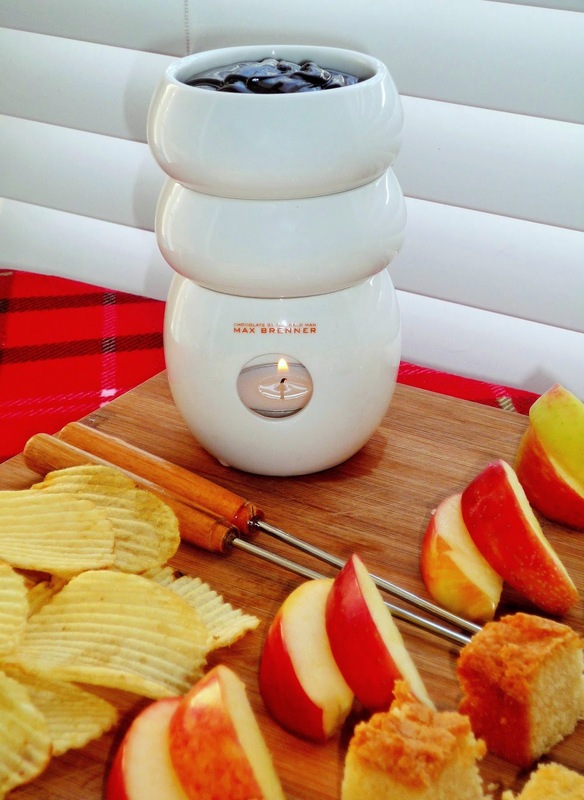 I paired our fondue with strawberries, apple slices, cubes of pound cake…and salty ridged potato chips. The potato chips are a bit of a curve ball, but they’re super fun! I'm serving our fondue in a fun Fire Water Chocolate Fondue Tower from Max Brenner’s. If you’re lucky enough to have a Max Brenner’s location near you -- or come across one during travels to the East Coast -- you can pick one of these fabulous three-tier warmers up! This warmer keeps your fondue perfectly melted, without scorching. The base holds a lighted tea light, the center piece holds warm water, and the top piece is for the fondue. The candle heats the water, which gently warms the chocolate. That means you're good until the last dip! Dippers of your choice: strawberries, marshmallows, apple slices, pound cake, angel food cake, pretzels, etc. Step 1: Add the heavy cream, strips of orange peel, and vanilla extract to a large measuring cup -- 4 cups works nicely. 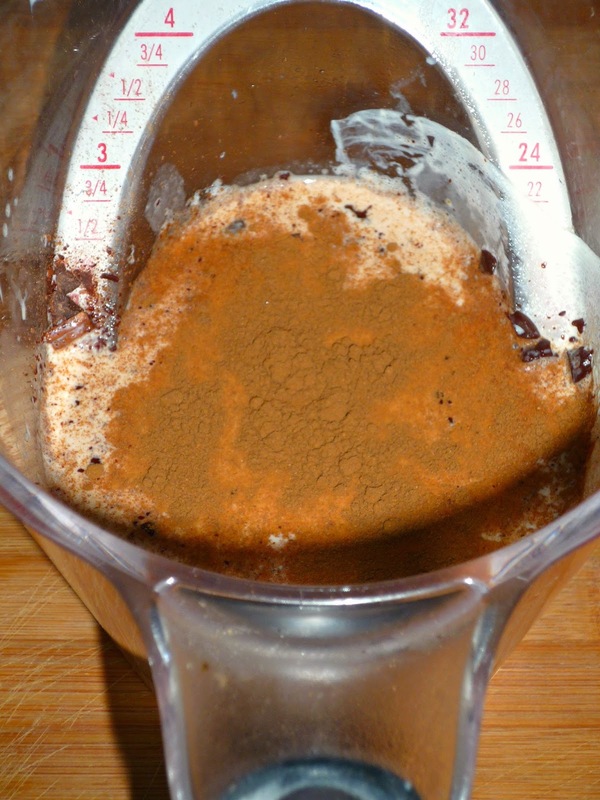 Microwave the mixture for 1.5 minutes, until it is hot. Let sit for 2-3 minutes so the orange peel is able to steep. Step 2: Add the chocolate and cinnamon to the heated cream mixture. Let the chocolate sit in the cream for 2-3 minutes to melt. Then, use a silicone whisk or spatula to completely combine all of the ingredients until a creamy chocolate fondue forms. It will take a minute or so to get the chocolate to completely combine with the cream -- so don't panic! Step 3: Taste the fondue and add more Grand Marnier to taste if you like. Carefully pour the fondue into a fondue pot to keep it warm -- the spout on the measuring cup is perfect for doing this without making a mess! Serve the fondue on a platter, with your favorite dippers. It's hard to believe something with just a handful of ingredients can taste so delightfully decadent. The two types of chocolate balance each other perfectly. It's the perfect for love this Valentine's: two different ingredients work together to make an even better combination! The chocolate flavor is definitely center stage here, but the hint of orange and cinnamon adds an exotic background flavor. This will be the perfect no-fuss dessert tonight -- everything is prepped and will be ready to serve in about five minutes. While the fondue re-warms, I'll have time to assemble my dippers on a serving board. Disclosure: Max Brenner's provided me with a Fire and Water Fondue Warmer as part of my Valentine's Gift Guide from earlier this month. All opinions expressed are solely my own.